CAMPING, HIKING, NARROW, WILD ANIMALS, HOT SHOWERS, FLUSH TOILETS, GREAT PLACES TO EAT, CAMPFIRES, AND GOOD FRIENDS. Refunds are only issue if there is a waiting list and those on the list purchase your spot directly from you. This is a rain or shine event. Full Refunds will only occur if Nation Park closes park for any unforeseen reason. PAYMENT, CASH, CHECK, PAYPAL, VENMO, QUICKCASH, FACEBOOK PAY...THERE ARE PROBABLY OTHERS. NOTE THAT PAYPAL I DO PASS ON THE PROCESSING FEES. Kids are welcome but hikes are in water (Narrows) and many of the hikes are elevation gain and drop. Parking- Only 6 vehicles may park at the group spot. 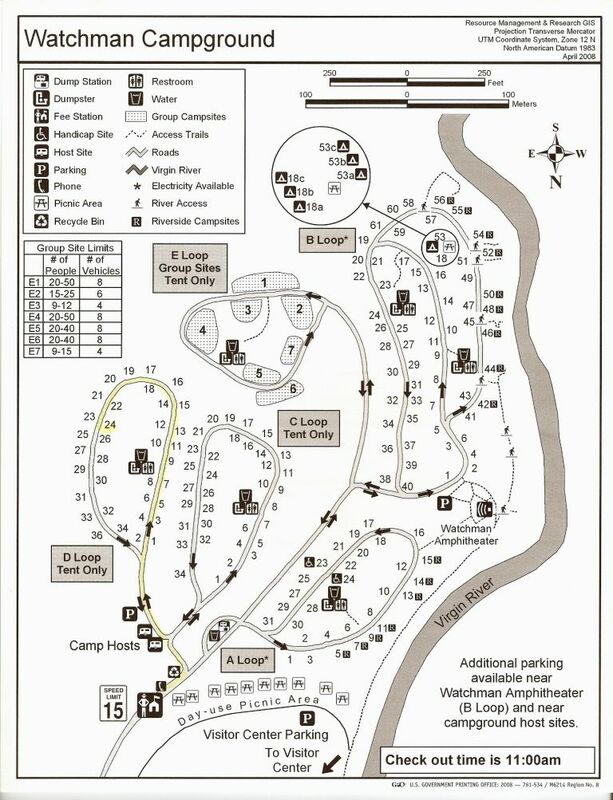 Remaining car are parked at the visitor center which is a 5 minute walk from campground. The two additional spots can park two cars at each spot. The two addtional spots require 4 to 6 people and only two tents per spots. If you believe you have that number let me know. No Showers, but there are public showers in town. AFTERNOON RAINS ARE NOT UNCOMMON. IT CAN BE HOT AND IT CAN BE COLD. IT CAN BE BREEZY AND...IT COULD SNOW. A TYPICAL OCTOBER DAY IS WARM, AFTERNOON THUNDERSHOWER, COOL TO COLD NIGHTS. Watchman Campground has no SHOWERS. There are public showers in Springdale. $5 for a few minutes. The river next to the campground is amazing and a great place to take a dip to clean off. My Plan is to leave at 6:30 am. I will be stopping in Las Vegas for Lunch. THE NARROWS HIKE- THIS HIKE MAY BE DIFFICULT FOR SOME SINCE WE ARE WALKING IN A RIVER BED WHICH IS ROCKY. Early morning rise to catch the first bus to the Narrows. The first bus to leave is 6:00 am from the Zion Canyon Visitor center. The Center is walking distance from the Watchman Campground. My plan is to be on that early bus to avoid the crowds that will hit the narrows as the morning continues to afternoon. You can catch the Narrows at anytime. There is no pressure to join me. Sleep in and enjoy Zion. :) I will be packing a lunch for the hike. My plan is to go as far back as I can. You can turn around at any time. You should have water shoes and walking stick (wood stick are best on the slippery rocks), and bring drinking water. You will get wet on this hike. Possibly head to toe. after the hike....Dinner- I will be eating in town. I will have a list of hiking options. You can join me or explore this amazing park on your own. Dinner Saturday- I will be heading out for dinner. Not sure where at this point of time. morning pack up and heading home around 10 ish am. Lastly, A GOOD ATTITUDE IS A MUST. I CAN SHOW YOU NATURE BUT I CAN'T PROVIDE YOU A GOOD EXPERIANCE. YOUR CHANCE TO HAVE A FUN TIME REQUIRES A GOOD ATTITUDE AND PATIENCE. I WILL AS GROUP LEADER POINT OUT BAD ATTITUDES AND DRUNKEN BEHAVIOR. NO DISCUSSION OF POLITICS, RELIGION, OR BUGGING PEOPLE TO DATE YOU.... THERE IS A $5 JAR FOR BREAKING OUR POLITICS, RELIGION OR BUGGING PEOPLE TO DATE YOU JAR.